Technology is slowly finding its way into football although it is unlikely to filter down to non-League level for a long time, if ever. However had it been in place for this game there could have been a very different outcome as even if goal line technology had ruled that Ben Baker’s close range effort eight minutes from time had been clawed back into play without crossing the goal line by Blues keeper Marcus Garnham one of two very good shouts for a penalty as Dylan Wilson was bundled down in the box may well have been awarded by a video referee. 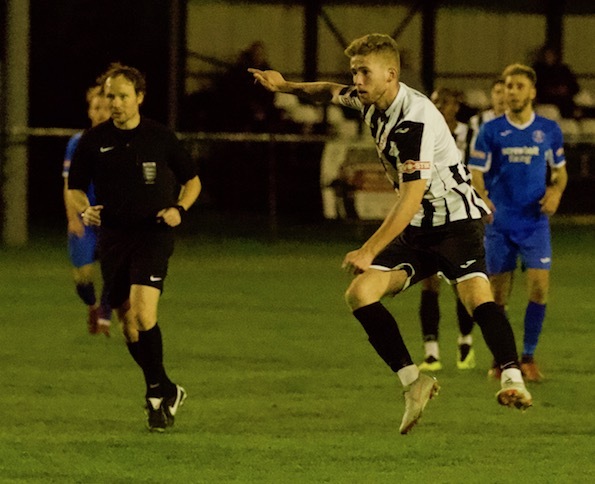 On the evening all of the decisions from the officials on the pitch went against the Ives condemning them to a fifth straight defeat in a row and pushing them ever closer to the relegation zone. All this in spite of a very promising showing against their play off chasing visitors. 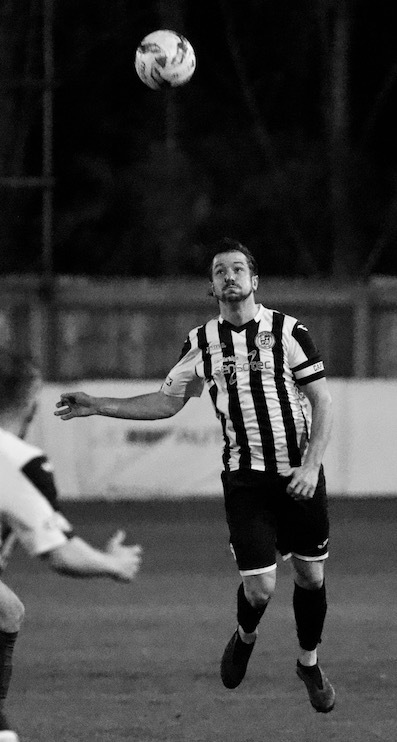 An even first period when Ives fell behind to a very well taken goal from Blues leading scorer Christy Finch was followed by a second half of excellent attacking play from the hosts that but for the heroics of Garnham would have seen them grab a well deserved equaliser. A break away second three minutes from time put an undeserved gloss on the score line for the visitors. Ives went into the game missing two of this seasons star performers with both Jarvis Wilson and Tom McGowan unavailable. 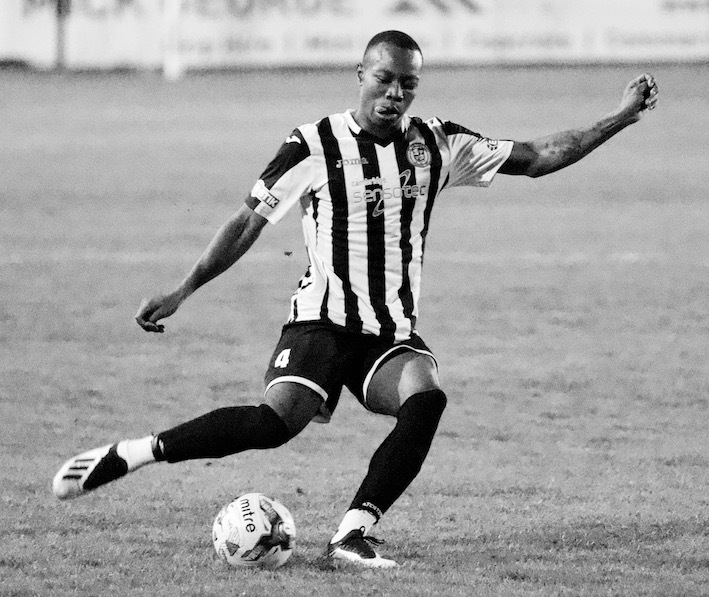 Owen Wallis dropped back from midfield alongside Sam Cartwright in the centre of defence with Munashe Sundire taking an unfamiliar role in the centre of the park replacing McGowan a position we were to find as the evening wore on that he relished. 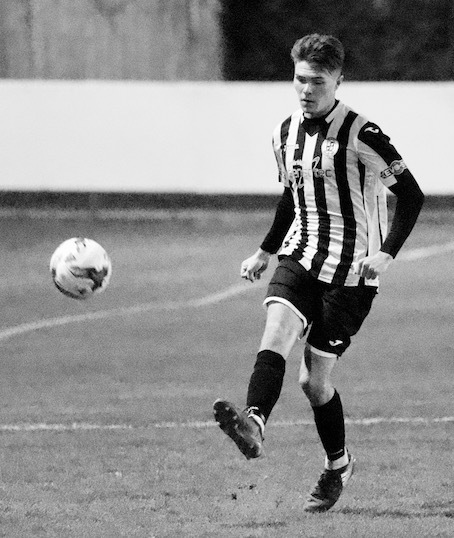 In other changes from Saturday’s heavy defeat at Rushall George Bailey came into midfield and the very promising Dylan Wilson replaced the recently disappointing Danny Kelly at centre forward. Although sitting in sixth place as they came into this game the visitors found themselves without a manager. Reserve manager Ian Cornforth and director of football Trevor Elmy were in the dugout for the game. In spite of their backroom problems it was the visitors who started the game of the front foot. Ives keeper Sam Wilson struggled to deal with an eleventh minute corner under heavy pressure. The loose ball was half cleared an eventually fell to Jake Reed who fired over from a good position. But the Ives were less fortunate three minutes later as Seb Dunbar and Patrick Brothers combined down the left. The latter’s cross to the near post area was excellently taken down by the skilful Finch who in one move turned Wallis and fired across the despairing dive of Wilson into the bottom corner of the net. 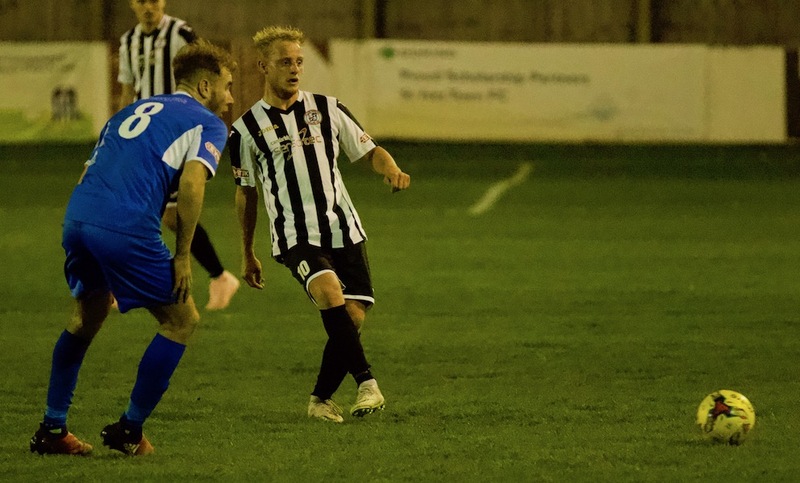 Although Ives were enjoying an even amount of possession with Sundire, Bailey and Snaith all working like Trojans in a crowded midfield it was the visitors who continued to look the more dangerous side when they broke forward. A quick Blues break in 23rd minute saw Kyle Hammond get down the right on the overlap his driven cross arrived at the feet of Finch at the back post and it took a brave last ditch block from Wallis to prevent the visitor’s striker adding to his opener. 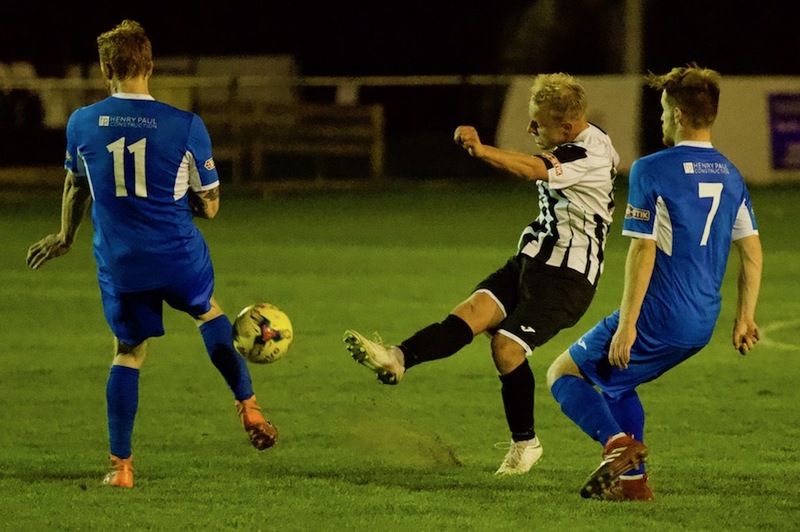 Ives first strike on goal arrived two minutes later as a poor clearance from Joe Jefford went straight to the feet of Bailey in a central position 25 yards from goal. The striker turned midfielder took a touch but fired his well struck drive straight into the midriff of the well positioned Garnham. Ives first shout for a penalty came just after the half hour as Wilson got a run on Blues skipper Tom Bullard cutting in from the right at pace he got into the box before Bullard came in with a clumsy challenge that took down the hard working striker. Referee Stephen Bates was well positioned but waved away the appeals. Would a video referee have come to a different conclusion? Ives continued to work very hard all over the pitch without managing to carve out another opportunity before the break. The Blues on the other hand continued to look dangerous every time they broke. In 36th minute Brothers again fed the overlapping Dunbar down the left. This time the full back cut in and went for goal flashing his low drive just past the far post. The same two players combined again three minutes later with Brothers providing a low cross to the near post that Byron Lawrence turned wide. The final opportunity of the first half two minutes into added time also went the way of the visitors. Finch played in Lawrence on the right and his driven cross flashed across goal just evading Reed at the far post. Ives came out for the second half determined to give it a real go. Ben Seymour-Shove curled a 25 yard effort inches wide only three minutes after the re-start. Wilson had his second, and probably best, shout for a penalty turned down three minutes later. This time he got away from Jefford and got a run into the box forcing Bullard to come across and commit to the challenge from an awkward angle sending the Ives striker tumbling. But again the well positioned Mr Bates deemed it a fair tackle. The Ives pressure continued but their apparent eagerness to gain a spot kick out of referee Bates went a little to far in 54th minute and Seymour-Shove picked up a yellow card for simulation as he went down inside the box following minimal contact from Hammond. 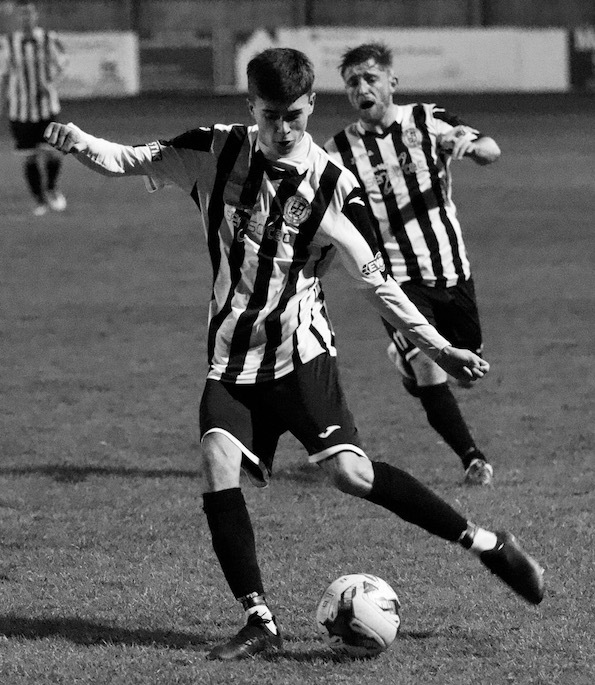 The hosts continued to press forward at every opportunity and in 59th minute Cartwright in the opposition box for a free kick got an unwanted flick on a Mark Coulson cross from the left to take the ball away from Wilson and Seymour-Shove both waiting to pounce behind him. Garnham pulled off a spectacular save to preserve his sides lead three minutes later. Robbie Parker pounced on a loose ball 25 yards from goal took a touch and unleashed a rocket that had goal written all over it as it arrowed in on the big keepers top left hand corner. But he was equal to it hurling himself high to his left to just get enough on the ball to deflect it over the top. The pressure continued to mount on the Blues back line in 66th minute Seymour-Shove outpaced Hammond down the left and delivered a teasing cross into the centre that evaded everyone. Joe Hood kept the ball alive and delivered it back into the mix, but still failed to pick out a team mate in the crowded box. The visitors did carve out one opportunity to finish the game amid the Ives purple patch in 72nd minute as Brothers got away down the left and delivered a low cross into the near post where Lawrence got across his man and got his close range effort on target but keeper Wilson did well blocking the effort and holding onto the ball at the second attempt. Back up the other end Garnham was up to his heroics again in 82nd minute as he pulled off an amazing save to preserve his sides lead. 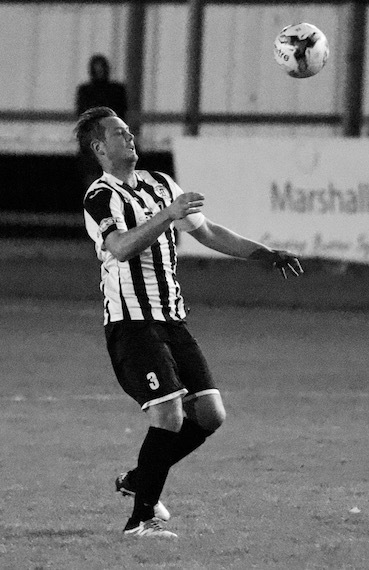 Coulson was again roaming forward and drove in a cross from the left that struck a defender’s chest and fell to Wilson inside the box. 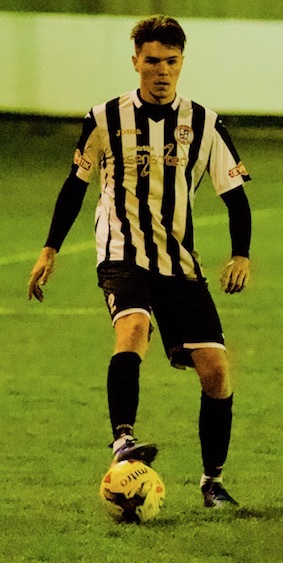 He unselfishly squared the ball across the six yard line from a narrow angle substitute Ben Baker was arriving at the back post and outmuscled Dunbar to get his effort on goal. Amazingly the out of position Garnham made up ground and hurled himself across goal to paw the ball away from under his crossbar. In spite of all Ives protestations that the ball had crossed the line the well positioned assistant on the near side deemed it had not. Even after that set back Ives continued to pile forward with the back from injury Charlie De’ath and Danny Kelly both sent on to add weight to the attack. Sundire who had covered every blade of grass on the night took things into his own hands with five minutes to go as he burst forward on a run that took him into the box. His attempted shot ricocheted off a defender and fell to Baker on the edge of the box but the young wide man failed to get over the dropping ball and his effort sailed harmlessly over the top. As so often happens when a team is throwing everything forward to try and grab an equaliser their opposition gets a break away to clinch the points and that is exactly the fate that befell the Ives. With three minutes to go Reed broke away at pace getting past the last Ives defender before unselfishly rolling the ball square to give substitute Cemal Ramadan a tap in to finish off the gallant hosts. This performance was a massive step up from the disappointment of the weekend, but unfortunately the result extends the Ives losing run to five games. This decline must be arrested quickly as with the table as tight as it is a couple of positive results could lift the team half a dozen places. 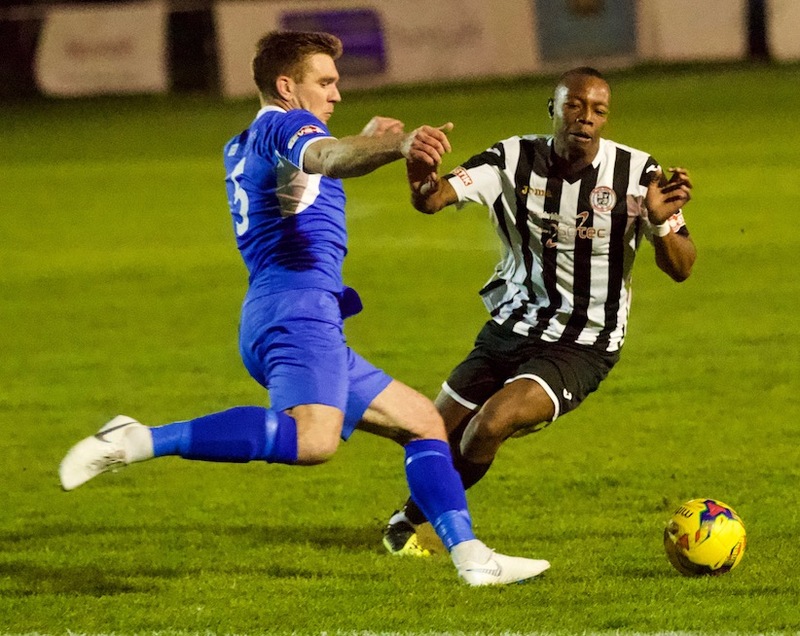 This weekend provides the chance of a second visit to AFC Rushden & Diamonds in a month. 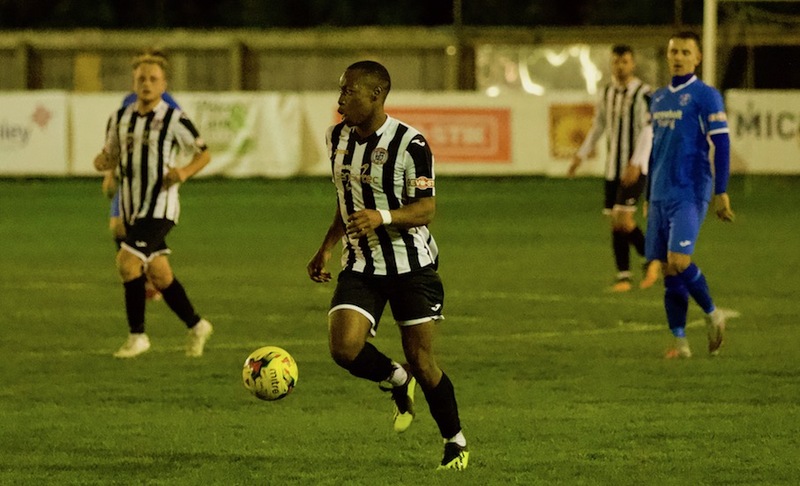 This time for an FA Trophy tie, the previous game was a very tight and cagy affair can we expect more of the same as we search that elusive win to get what started as such a promising season back on track?. Report by Nigel Howlett. Photos by Louise Thompson.